SFBC. Hardcover. 0739423991 New Condition. . New. SFBC. Hardcover. 0739423991 Like New Condition. . Fine. Science Fiction Book Club - The Berkley Publishing Group, 2002. 592 Pages. Black boards with gold spine lettering. Brand new condition protected with a Demco Polyfit vinyl covering. 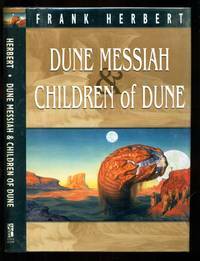 Includes both books - Dune Messiah and Children of Dune. The Classic Sequels to Frank Herbert's Dune. A shorter version of Dune Messiah appeared in Galaxy Magazine in 1969. This edition is the March 2002 First SFBC Printing. Frank Herbert's Nebula- and Hugo-winning Dune introduced readers to one of the most complex and compelling worlds in science fiction-Arrakis, the desert planet Dune ... a world at the center of a galactic power struggle. Here are the second and third novels of the original Dune trilogy, continuing the monumental story that has become one of the best loved SF sagas of all time. Dune Messiah A holy war fought in space and on a thousand planets had made Paul Atreides the religious and political leader of the galaxy. The product of generations of controlled breeding, trained in the arcane disciplines by the Bene Gesserit sisterhood, he had more than human powers, including the ability to sense the shape of the future. Then the Bene Gesserit, unable to dominate the man they had made a god, set out to overthrow him. But Paul Atreides could foresee their plans and shape them to an unexpected and shocking goal. ... Children of Dune When Paul Atreides mysteriously vanished, he left only his two young children as heirs to the coveted throne. Fortunately they had been endowed with superior intelligence and. the memories of their ancestors, for each day brought them new dangers. When one was abducted, the other was forced to seek sanctuary in the scorching flatlands. There his mind began to swirl with thought-patterns from strange times and places, warning him of the terrifying perils awaiting Dune ... giving him an improbable plan to save it. .. and predicting his destiny as ruler of the entire world. But were these messages real-or the delusions of a mind deranged by heat, exhaustion and the addictive spice, Melange? . First SFBC Printing. Hard Back. As New/As New. Illus. by Hickman, Stephen - Jacket Art. 5 3/4" x 8 1/2". SFBC. Hardcover. 0739423991 Item in very good condition! Textbooks may not include supplemental items i.e. CDs, access codes etc... . Very Good. SFBC. Hardcover. 0739423991 Please allow 4 - 14 business days for Standard shipping, within the US. Thank you for supporting our small, family-owned business! . Fair. 2002-02-01.